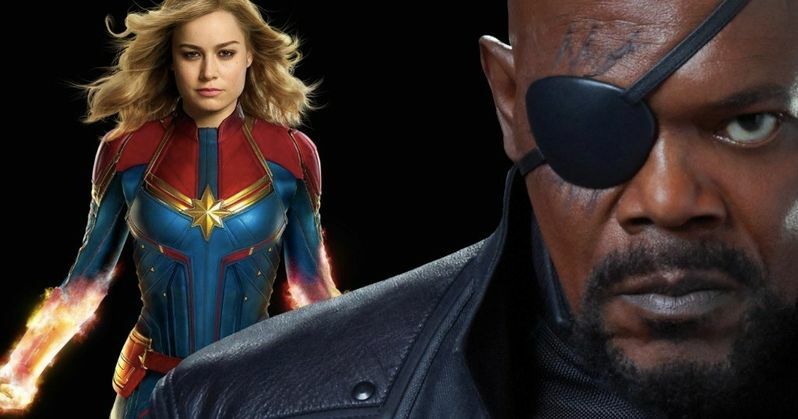 The Captain Marvel Prelude #1 comic book reveals why Nick Fury waited until Infinity War to contact Carol Danvers. At the end of the last Avengers movie, before Fury turns to dust with half of the universe, he sends a distress signal to Danvers on a pager. Since then, Marvel Studios boss Kevin Feige has revealed that Danvers will be the most powerful character that we have seen in the Marvel Cinematic Universe thus far, which has led to questions about why Fury waited so long to contact her. Marvel Comics released Captain Marvel Prelude #1 today, and it starts to tell the story of how Carol Danvers gets involved in the MCU. With that being said, this first comic is dedicated to Nick Fury, Danvers isn't even in the story. This sheds some light on the relationship between Danvers and Fury. Fury shows Maria Hill the pager for the first time in the comic and says that he wants to avoid calling on her, noting that she is a last resort. Captain Marvel Prelude #1 author Will Corona Pilgrim also shed some more light on Nick Fury's decision to contact Carol Danvers at the end of Infinity War. Thanos is a major threat to the universe, as we saw in the last Avengers movie. The Mad Titan was able to obtain all of the Infinity Stones and completed his mission to bring balance to the universe. Pilgrim had this to say about why Fury waited so long to contact Danvers. "Carol's the biggest gun you've got and Fury's never one to waste a silver bullet, so if he's finally making that call after all this time and after all he's faced alongside the Avengers, then he's truly seeing the situation as a last resort." Will Corona Pilgrim's opinion about the strength of Captain Marvel echoes the thoughts of Kevin Feige. With that being said, it's going to be very interesting to see her show up in Avengers 4 after her own standalone movie. The Quantum Realm will play a large part in the upcoming movie, and it's believed that Carol Danvers will be connected to the mysterious realm in some way. Hopefully we'll see that connection in Captain Marvel early next year. Elsewhere, Nick Fury stepped out of the limelight during the events of Civil War. He vanished to take care of stuff that didn't catch the attention of the Avengers, but still kept an eye on them. Before the Infinity War, Fury met with Steve Rogers and urged him to make up with Tony Stark because he knew that something big was going down. Rogers declined, and Fury sent Maria Hill to meet with Stark for the same reasons, and was also denied. You can purchase the Captain Marvel Prelude #1 over at Marvel.